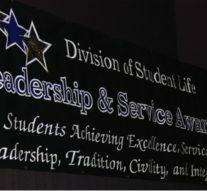 The evening of April 15 marked the 20th annual Tarleton State University Leadership and Service Awards, presented by the Division of Student Life. The Leadership and Service Awards are broken down into six categories that are Tarleton’s core values: leadership, integrity, excellence, civility, service and tradition. Lathes Towns, the director of transition and family relations, announced the winner for the awards that fell under the leadership category. The Engaged Freshman Award was given to Andres Vasquez, while the Sophomore Leadership Award was given to Cecilia Flores. According to the Leadership and Service Awards pamphlet, these awards are given to the freshman and sophomore “who is most actively involved in all aspects of campus life.” Towns also presented the Leadership in Athletics Award to the TexAnn softball team and the May Jones Advisor of the Year Award to Margaret Risher, the advisor of the Tarleton Anime Club. Darrell Brown, the executive director of student engagement, took the stage to announce the awards under the integrity and excellence categories. The Greek Man of the Year Award went to Tyler Daniels of Sigma Chi, while Greek Woman of the Year was given to Courtney Hathorne of Delta Zeta. These awards are the only two that fall under the integrity category and are given to the male and female students who “shows commitment, leadership and appreciation for their Greek letters and the Greek community as a whole,” according to the Leadership and Service Awards pamphlet. Brown went on to award Delta Zeta with the Award for Fraternal Excellence, which is “presented to the nationally affiliated Greek fraternity or sorority that symbolizes the excellence of the Greek system.” Delta Zeta was also presented with the Colonel Will L. Tate Organization of the Year Award, which is given to “the organization that has dedicated itself to the development of individual members as well as making a difference in student life at Tarleton.” The Student Life Award, which is the last award under the excellence category, was presented to Dr. Mike Leese, the Associate Vice President of Student Life/Dean of Students. Program of the Year, W.O. Florene Trogdon Service Individual Award and W.O. and Florene Trogdon Service Organization Award are the three awards in the service category. Program of the Year, which is presented to the most creative and innovative group or organization during the current academic year, went to Tarleton Serves, which is a student organization focused on volunteering in the community and beyond. The Service Individual Award went to Andrew Hatcher, while the Service Organization Award was presented to Delta Zeta. The Dr. Wanda Mercer Tarleton Legend Award and the John Tarleton Spirit Awards are the two awards that fall under the tradition category. The Tarleton Legend Award is given to “two or more individuals who exemplify a Tarleton Legend by fostering tradition, leadership, scholastics and excellence in every aspect of his/her collegiate experience.” This award was given to Kendyl Adams and Sean Strickland. The John Tarleton Spirit Award is presented to twelve people who are juniors, seniors or graduate students who are thought to be a true representation of the spirit of Tarleton. The twelve recipients this year were Tyler Daniels, Andrew Hatcher, Courtney Hathorne, Angelica Iraheta, Grace Lopez, Madison Paradis, Marissa Pena, Rachel Plunk, Emily Roberts, Lura Rylant, Derek Soper and Sean Strickland. Various organizations on campus such as School Wide Activities Team (SWAT), Student Government Association (SGA), JTAC and the Texan Cheer Squad were also recognized for their continuous hard work throughout the semester. The Leadership and Service Awards were wrapped up the unmasking of fourteen purple poo. For the TTS, Courtney Hathorne, Marissa Waldon, Lupita Ortega, Kaleigh Colbert, Madison Paradis, Falysha Williams, Kalli Vil and Raevon Zamarron revealed. For the TTP, Ulises Godinez, Kelby Mitchell, Austin Eoff, Luke Rohrbach, Jeremy Ratcliffe, and Cade Flory revealed.